How do you scale your business from $0 in revenue to $1 Million online? This is the question that I’ll be focusing on in this article. From $0 to $1 Million, there is one issue your business should focus on, SALES! Beyond $1 Million, a business has mastered the channels of sales, and now can grow quickly by extending their product line. However, from $0 to $1 Million, what matters in a scalable business is selling effectively. This article discusses a methodology to scale your online sales by evolving your Sales Funnel. This post walks through the evolution of a sales funnel as it moves a business from $0 to $1 Million in revenue. The above model for an online sales funnel shows an intricately woven series of steps beginning with high quality content, and moving through a 5 step process. The last 5 step sales funnel I created included 5 autoresponder sequences (28+ emails), 5 landing pages, over 17,200 words of copywriting, 10+ ads, 9 videos, and 21 custom designed graphics. To do all of this at once, you’re talking about a $15,000-$30,000+ investment of time and resources. That’s a lot of money for a small business owner, which is why I suggest a different approach. The easiest way to accomplish this is to breakdown the process into evolutionary steps. At each step, you see additional value added and it gives you the confidence to continue building your sales funnel. When we work with our customers we breakdown the project into 5 major iterations. Each iteration should be created as a fully working evolution before adding the next one. This assures that the sales funnel is working at every step of the process and paying for itself. Each evolution in turn, improves your conversion numbers, decreases your customer acquisition costs, and widens the gap between you and your competitors. Although, I agree that this strategy requires adjustment for each industry, it has broad application. Similar sales funnels have been used by brick and mortar businesses like McDonalds and online behemoths like GoDaddy.com. The best method we've found for marketing our business online has been creating keyword-driven content that's best in class, and also reflects the services we do. Bigger is better (iphone 6). Less is more (short emails). Nobody is perfect (typos). The turning point in my business came when I shifted from a global marketing online effort to connecting with people on a one-to-one basis. For me, a strong and engaged LinkedIn network and picking up the phone has been what's solidified big contracts. Content that provides value to the reader is so important. Create sharable content that will continue to be shared long after the original posting date. The naked truth is that you can't lie forever so your best deal is just to be yourself. Period. In order to set yourself apart... I have found the most valuable option is being uncomfortably transparent and authentic. The most effective way to market your business online is to participate, engage and deliver value in places where you'll find your customers. The most effective system I've found for building sales into six figures is to build a genuine rapport with your followers. Tell your story. In a world full of "me-too" businesses your story is the only thing that sets you apart from everyone else, and literally nobody else can copy it. Start using your story and you'll see exponential results. The best online marketing tip I can offer is patience and hard work. For our clients we've found producing well-written, helpful content that isn't about us or selling has been the biggest lead generator. One thing I always recommend is to begin marketing your business online by focusing on email list-building techniques. The most effective marketing growth tactic I've ever used, and continue to use, is to build genuine relationships. The power of social media is not in selling directly, but in inspiring and motivating others to do it for you. Give as much value as you can for free, and it will result in revenue. You know what it takes to effectively market your business online? A good story. Really know your audience before you do anything. On social media, have an active presence where your target market hangs out online. In other words, "fish where the fish are." Be relevant. Be consistent. Invite your followers to learn more. The most EFFECTIVE tip for marketing a business is to focus on individual connections over mass reach. I found that being authentic and true to who we are has a fantastic effect on our marketing efforts. You could have the best idea in the world, but you're not gonna profit from it if no one knows it exists. The most effective thing you can do to market yourself, online or offline, is to go beyond just the service or product and bring personality to the project. What is the Path to Growth: $0-$10,000,000? It helps when you begin to keep the end in mind. You must begin with nailing your core offer. Anything short of hitting the head of the nail will stunt your growth. The $0-$100,000 range is the most difficult of all the growth stages. You’re battling for survival, and you don’t have the resources and expertise of a large business. This requires constant iteration, and humble learning from the market. After talking to many entrepreneurs, the 6 figure point seems like a breaking point. When you’ve gotten there, you’ve achieved something special, but you’re still only at the beginning of your journey. After you master one core sales funnel, you can take that high converting core offer and multiply your sales funnels by adding more marketing channels. A single successful sales channel can easily make revenue of $100,000+ per year (revenue size depends on your type of business, offers, scalability of offer…etc.). By adding more sales channels, you can reuse all the work from the first sales channel (landing pages, customer research, content…etc.) but grow much quicker by multiplying your ads across many sales channels. At this point, you’ll also extend the sales funnels you’ll be using. In the first step, much of what you did was focused on initial customer acquisition. However, at this point, you’re going want to maximize your customer value by running acquisition sales funnels alongside profit maximization sales funnels. As a little peak beyond $1,000,000 in revenue, after you’ve spun out multiple sales channels and extended your sales funnels your next step is to multiply your product offering. This works effectively because you can leverage your team’s knowledge of your current customers and previous sales channels. Many of your customers will buy your new product offerings. This in turn multiplies the value you gain from all the sales channels you’ve spent so much time mastering. This article is meant to provide a framework for thinking about growing your business from $0 to $1 Million in revenue. That means perfecting and building 1 highly effective core sales funnel, then multiplying that across multiple sales channels. These resource provide a great conceptual framework for scaling your business. What I want to do with this article is to give you a peak into the process of building out and scaling your business online. Think of this as one of my $100 consulting session for free. My gift to you. I’m going to give you a peak behind the curtain of what it takes to grow your business in a scalable way. Nothing held back. Definition: A Core Offer is the main product or service you sell. Your core offer is the center of gravity for your whole sales funnel. Everything else you do will be built around this offer. All content, free give-aways, and low-cost products will be crafted to attract customers interested in eventually purchasing your core offer. Even your product maximizer will be created in a way to up-sell and cross-sell customers who want your core offer. That’s why it’s so important to nail your core offer. Many businesses don’t have a compelling core offer, and it stunts their growth. Here are some examples of Core Offer Landing Pages around the web along with explanations of what sales techniques they’re using. Unique Sales Proposition (USP): Virtual Gym and Coaching. This is a different take on selling online. She increases her customer lifetime value by building a community around her brand. Sales Video: Sales videos increase engagement and will capture a lead’s attention for a longer time than words on a page. This allows you to lead them into the sale, and thus increases conversion. Bonus: Special Bonus – 7-Day Jumpstart Kit and “discounted” sale. Productize Your Offer: When you give your offer a name, and show a picture of a 3d product then you’ve effectively productized your offer. This technique builds more value than if you talked about your offer in more generic terms. She did this with her Bonus give-aways, and core offer (less effectively in my opinion). Branding: I think Betty Rocker does a great job of living her brand. She has great graphics for her own logo, and includes pictures of herself in most of her products. She personifies her brand. This landing page does a great job of using testimonials throughout the page. She even used customer’s comments to answer what concerns other people might have about joining her online program. Here’s a quick overview of the different techniques used on this landing page. Niche Your Offer: The Glass Collage is a new type of mixed media art. Since Mary Hong is a celebrity in the Glass Mixed Media niche, she has chosen to create a product targeted at a niche that she can serve better than any of her competitors rather than going after a larger, highly competitive arts and crafts market segment. Sales Video: Sales videos increase engagement and they capture a lead’s attention for a longer time than words on a page. This allows you to lead them into the sale, and thus increases your conversion. Layering Value: By calling out all the different parts of the offer, you’re able to build up value in a customer’s mind. This in turn makes the customer feel like they’re getting a great deal. Bonuses: Order now to receive extra videos, an extra “Bling Kit,” and a 20% discount. Bonuses add an additional layer of value that customers feel is beyond what it required. Scarcity: By limiting the offer to 3 days, it forces a lead to make a decision now or miss out. If you can put a little fire underneath your lead’s feet it’ll push them to buy before they forget about your original sales pitch. Branding: Mary Hong shot a sales video, and added her personal stories throughout the landing page. Even her url holds her name. This increases the customer’s awareness of Mary Hong’s personal brand. Good branding is a long-term investment in your business. Social Proof: Written Testimonials and referencing all of the publications that have featured Mary Hong’s art builds social proof. This social proof helps people feel more comfortable about buying the core offer. Deep Platform: Whenever you talk about Tony Robbins’ marketing, you have to look at it in the context of how deep his platform is. He’s branded himself through speaking, writing, and appearing in movies. He’s one of the few self-improvement gurus who has reached saturation in the market. Developing a deep platform improves effectiveness at every step of his sales funnel. Sales Video: Tony Robbins also uses a sales video… but you already know the benefits of that from my above comments. White space, Formatting, and Bullets: Making content skimmable is a smart idea. The more you can separate out content and pull out the most marketable points, the better your offer will do. Layering Value: Tony Robbins also included extra bonuses and productized the subparts of his offering. This created a layering effect and made you feel like you were buying an entire library of self-help resources in this one offering. Branding: Tony Robbins does a great job of branding himself. His face is on every book, and he has appeared in multiple movies. This landing page is no different. He appears on the productized pictures of his offering, and he’s making the sales pitch in his video. There are tons of examples of how to create effective core offers and landing pages that do it well. Since this blog post is already getting too long, I’ll have to point you to my updates and newsletter if you want more examples! You should always start a core offer brainstorming session with a discussion of your customers. Develop Your Customer Personas: To develop a Customer Persona, you should name a specific type of customer (ex: Monica – Small Business Owner). Then use the below starter questions to write a description of that customer. How old are they? What stage of life are they in? What demographic information is relevant? Where do they hangout online? Who do they follow? What books, magazines, or blogs do they read? What we do in our initial consultation with our customers is start by using the above questions to write a description about their Customer Personas. Next, we write out each stage a customer will go through to purchase your product. Thirdly, we go through our 5 Layers of Insight questions to get a deeper understanding of that customer. This process has proven very effective and gives us a remarkable ability to predict a customer’s purchasing triggers. Note: I had waaaay too many resources to fit into one post, so I squeezed a ton more information into a free resource that I’ll link to below. No offer is going to start off perfect. In fact, if you’re launching your first landing page, it’ll probably be pretty bad at converting leads to customers. To improve on this you’ll need unbiased information straight from your customer. One of the most effective ways to improve your offer is by split testing. Definition: Split Testing is the process of testing one ad or landing page against another, and looking at the metrics to find which one performs the best. After completing a full test, you keep the best, and dump the rest. Finally, create a new ad or landing page and test it against the best. • Google Analytics Goal Tracking: Setup Google Analytics goal tracking to track your conversions compared to your traffic. • Ad Metrics: Most ad platforms online offer you accurate information about Click Through Rate (CTR) and clicks. Take that number of clicks and compare it to the number of lead submissions or emails you get to get your conversion rate. • Google Sheets: You can only improve what you track. Keep a journal for your business of which offers performed better than others. I oftentimes do set this up in Google Sheets, and summarize my month’s performance. Honestly, that’s all you need to start split testing. Use the free classics I mention above to get started. An extremely effective way of understanding your customer is by doing deep interviews. The deep customer interview looks beyond superficial customer surveys to figure out what drives customer behaviors. Buying decisions are rarely based on logic or conscious thought. Instead, people tend to make emotional decisions, then go back and legitimize those decisions with logic. Forming an offer that sells to deeper human needs will convert better than a logical argument. A great resource I know of for this process is How Customers Think by Gerald Zaltman. If you prefer the customer interviewing process in a story format, you can check out: All in Start-up by Diana Kander. After my first draft of this article I was at over 6000 words with a lot more to say! In order to get anyone to read this, I had to slim it down. I removed about 10 awesome resources and then squeezed them into a free download. I highly suggest downloading! Enjoy! I put a lot of work into it. Figuring out what traffic to buy is an important step in developing your first sales funnel. 1. How scalable is your traffic source? Can you find a targeted niche that’s greater than 50,000 people and converts at a high rate? 2. What platform matches your business? Be careful when refining an offer for a small-volume niche. After you spend a lot of resources perfecting your offer you’ll find that you can’t grow it. That’s why you want to test your offer against large niches that you can grow into rather than only small niches. 3. Does your sales funnel match your selling style? Scaling from 0-1 Million is largely about selling. I strongly believe that you should build out your sales funnels around your selling strengths. Are you a great writer? Try a content marketing strategy built around blogging. Are you a great speaker? Record webinars and videos or speak at events. Do you like meeting people? Try podcasting and interview thought leaders in your niche. If you enjoy the way you sell it’ll multiply your motivation and your effectiveness in selling. Now that we’ve covered the initial build-out of the core offer and traffic source, let’s discuss the next evolution of your sales funnel and why it’s important. A lead magnet is a free offer or a coupon that you offer to people oftentimes to join your email list. The lead magnet can start off as a simple free give-away for an email. Behind that you should add a monthly newsletter where you provide value to your email subscribers. Here are some examples of lead magnets from sites across the web. Raffles and giveaways are a great way to get contact information for customers at a large scale. Free E-books, white papers, checklists, and other digital media is also a scalable Lead Magnet since it doesn’t have any extra cost associated with it. Overstock.com and many other online retail stores offer a discount on your first purchase and an entry into a rewards program. This is another example of an effective Lead Magnet. Oftentimes, this is the point where business owners stall. At this point, you should have a lead magnet setup. This lead magnet converts visitors into email addresses and also retargets incoming leads to your core offer. A/B Testing offers, titles, benefits…etc. Add an indoctrination auto responder with a one-time offer: adding an auto responder set of seven emails, ending in a time-bound offer for your leads to move on is an easy next addition that will increase your sales funnel conversion. Add retargeting to anyone who visited the page but didn’t download your offer. Retargeting acts as an invisible list of targeted leads. Add a follow-up email sequence following this format: offer, additional benefits & time-bound offer, fear (last chance! ), follow-up. Add a monthly newsletter that provides valuable information for your customers. Now that you’ve get a steady stream of new leads coming in, you’re going to want to get into the habit of creating great content that keeps your leads warm until they’re ready to buy. This often means sending out a newsletter at least monthly. In order to get your customers looking forward to your newsletter, you’ll want to create great content to send them. It naturally flows to build-out a content marketing strategy at this step in your growth. On top of that, most ad platforms will penalize you for sending people directly to a Lead Magnet. They want to create the best user experience for people using their website. Oftentimes you actually see a similar conversion rate with a higher engagement rate if you can send traffic to an epic piece of content, and then retarget them to your Lead Magnet. Higher engagement means more sales at the end of the funnel. This is a 2500+ word blog post that provides a crazy amount of value. Want an example? THIS POST YOU’RE READING . Buffer creates a lot of ultimate guide posts. I checked one of their recent articles and found this guide to SnapChat. That’s right about 3700 words! People love visual representations of content. This is also a good way to get links. Create an embed code that people can copy and paste onto their site. Have you created a lot of high quality content for a webinar? Why not record it and provide it as an evergreen webinar to your customers?! I love automation. Sign me up! I’ve tried out Easy Webinar, which worked but was lacking some functionality. Webinar Jam is an up-and-coming service that shows a lot of promise. You can also always check out the industry leader: GoToWebinar. This one is priced higher, and doesn’t have great automation functionality. BuzzSumo is an excellent tool that I use a ton for content marketing. Sign-up for a free trial of BuzzSumo and get a list of all the top shared articles in your niche. Then write a short blurb about them and send them out in your newsletter. Take it one step further… Did you know that paper.li can auto-magically curate the web for you? They create a curated blog from RSS feeds. Not a bad choice for small businesses in my opinion. Whatever you do, make it something that provides value not spam. Try to create a sense of WOW in your customer. That WOW factor is what pushes you above the noise of your competitors and will assure your customer will remember you. Everything we talked about before was working up to the goal of building up to your profit maximizer. Profit Maximizers are where you cash in off of everything you’ve built up to this point. In most businesses, 20% of your customers will provide you with 60% of your sales. A profit maximizing strategy is the way you maximize your customer value. This can be a cross sale, up-sale, recurring transaction… whatever makes sense in your business context. However, by setting up this last step it allows you to cash in off of all the work you’ve done in steps 1-3. It’s hard to compete in a competitive world where you have to make the bulk of your profits off of your core offer. Below I go through some examples of profit maximizing strategies. The Amazon.com “Frequently Bought Together” suggestions. Amazon is brilliant in how they setup their upsell. On the landing page, they have a single button that lets you add three “Frequently Bought Together” books into your cart as once. Their algorithm finds the book, and their cash keeps rolling in. Perry Marshall is a well-known internet marketing. He has a plethora of cross sales and upsales to pick from. However, the peak of his pyramid is his Private Client Group. This is a group of 12 clients that he personally coaches. Considering he’s one of the most well-known internet marketers around, you can bet you’ll be paying a pretty penny to put him on your speed dial. The most straight-forward way for setting up your simple up-sale is sending anyone who just purchased your core offer straight to your Profit Maximizer landing page. A hot customer who just bought from you is most likely to up their purchase if you offer to serve them an even BETTER solution! Dominate the low-end of the market and the high end. Leave the middle to someone else. Many high-flying consultants take this approach. They focus on writing a book that establishes them as a leader in their field. Then they use that book as a low-cost offer (Trip Wire – Explained more below…) to create an online platform for themselves. Oftentimes, they’ll setup a “free with shipping” landing page that increases the perceived value of their offer. They make nothing off the book, but they grow a very large list of people who know their name. This is the way Russell Brunson grew his marketing platform, and a technique Ryan Deiss used to launch his Digital Marketing platform. Tim Ferriss has a great example of a Profit Maximizer. If you do not know who Tim Ferriss is, he’s the popular author of the 4 Hour Work Week. He went from being a no-name author to growing one of the largest online platforms around. However, after growing such a large platform, how do you cash in on it? Easy, teach a bunch of high spending publishers, authors, and agency-types the new world of publishing, for a small fee of… $10,000/person! Limit 200 people. Not bad Tim. That’s $2 Million for a weekend conference. Have you ever noticed how grocery stores place the milk, eggs, and perishables at the back of the store? These grocery items that spoil are the reason you have to go to the store every week. Wal Mart isn’t dumb. They understand that if you walk by rows and rows of food on the way to your eggs you’re going to grab more stuff and put it in your cart. This is a subtle cross sale. Vista Print mimics this strategy in their sales funnel online. They draw you in with cheap business cards (a low-cost offer you’ll need to buy over and over). Then they make you click through 5 pages of up-sales. Watch the video below to see some of the cross sales they offer to capitalize off of their low-cost business card offer. That’s only 1 of 3 pages of up-sells! They also offer all kinds of glossy and different fancy card stock, back and front printing, your business card graphics on everything from posters and coffee mugs to mouse pads and shirts… I can’t watch the video without wanting to get one of those business card holders for my office! Seriously, they know how to maximize their profit! • Grocery stores have the candy in your checkout line. • Almost every store tries to sign you up for a credit card. • Have you ever Super Sized a meal at McDonalds? • Events often make you pay for parking upon arrival. • Best Buy sells their “high-end” T.V. cables at a huge mark-up and requires you to replace your washer hose with a new washer. I had a sales associate try to convince me the cable I bought would increase the picture quality on my T.V. I’m not sure if all those 1’s and 0’s become more readable with your thicker cable. You can find cross sales everywhere. This maximizes your long-term customer value. Got any more ninja tricks!??! Drop us an example in the comments! 1. Targeted Buyers list: It’s such a great deal that customers can’t say no. By offering an incredible deal on the frontend you’re able to quickly assemble a large list of highly targeted paying customers, who you can market to for free (or low-cost). This was the classic Columbia Records case where they sold records at $1/ record, and got virtually every music lover in America to self-identify and create a buying relationship with them. 2. Break Psychological Boundaries: A low cost offer creates a low risk situation for a new customer to buy from you. This can improve the conversion rate of your entire sales funnel. After a customer makes a single purchase from you, you’re no longer a pesky marketer, now you’re a friend providing valuable resources. 3. Fast Scaling Ad Buy: Another powerful attribute of using a tripwire on the front of your funnel is that you can immediately pay for the cost of acquiring new leads. This makes your campaign more scalable because when you get cash back faster, and you can reapply that cash to advertise again and again. Jon Morrow is a celebrity in the blogging niche. He grew to prominence by being an unpaid editor of a few major blogs like Kiss Metrics and Copy Blogger. He offers a trip wire where he’ll give you a list of all the different websites that will accept guest posts from you. We already talked about Vista Print from a Profit Maximizer standpoint. I wanted to revisit them because of the effectiveness of blending a profit maximizer with a Trip Wire. This is a classic example of an offer too good to refuse. This allows them to create a buying relationship with almost a large number of small businesses in the country. Who can compete with those prices??? They’re probably not making any money on the cards themselves. However, as we illustrated earlier, they take customers through 5 pages of cross sells and up sells. Who’s going to make it through without accepting at least one of those offers? GoDaddy replicates a similar formula. They sell you a $2 domain name, probably losing money, but then they proceed to sell you hosting, websites, email packages, and everything else you can imagine! FREE BOOK! Who can say no to that? Nobody! A popular Trip Wire is when authors offer a “free book” (+ shipping) or $1 Amazon book on the front end of their sales funnel. It’s such a good deal that a ton of people take marketers up on the offer. This gives them the chance to up-sell and cross-sell their customers on high ticket products. Here’s an example of the free book offer over at DCS Labs. Below is an example of how Ryan Deiss built a $1 e-book into the opening of his sales funnel for a book publishing information product. • McDonalds $1 Value Meal: They were the first ones to offer the super cheap $1 burger. WOW! When I was a kid my parents used to get it for me. I LOVED IT! Then they’d proceed to order combos, super size things, and maybe even throw in an extra ice cream cone. You know how it goes. Who can say no to those fries? • X-Box: Microsoft will oftentimes sell their X-Box at a loss, or barely break-even. They can do this because they’ll make a killing off of all the royalties from every game that’s sold. • Kindle: The Amazon Kindle does the same thing. They dominate the e-readers niche, and by selling their E-Reader at near cost, very few competitors will find it financially feasible to take them on. However, they make royalties on all of the books sold on Amazon.com. • Black Friday Door Busters: You know all the deals stores pull out to get you to come into their store. I remember one year it was GPS’s. This was THE fun new gadget before we all had IPhones. They were being sold at break-even costs to get us in the door. With a deal that great, they knew I’d be in the store right along with the other 1000 GPS-less tech-a-holics. Once you’ve built out a successful sales funnel correctly, you’ll find that the offers can scale very rapidly into different channels. To go from $100,000 to $1,000,000 simply takes 5-10 targeted channels versus 1-2 at the 100,000 level. If you have a proven offer, you can make that same sales pitch work across numerous websites, magazines, direct mail campaigns, and other advertising mediums. Different marketing sources have different costs and scale inherent in the channel. For example, you may be able to run an effective test PPC campaign for $5/day. Whereas getting cable slots and developing commercials could be $10,000+ in start-up fees. Starting here gives you the lowest and most targeted rollout. These traffic sources are perfect for fine-tuning and testing your new offer. I put this as a second step because by focusing on content producing, you’ll be able amplify everything you’ve done in the other ad channels. More free offers, more options for trip wires… etc. In building up a content marketing strategy, you will naturally create relationships with other influencers. That’s why at this point it’s smart to start capitalizing on other people’s platforms. So you’re ready to spend serious cash on larger scale online and print advertising? Testing your offers in the above lower-risk, lower-cost channels will give you the confidence to take your targeted digital offers and put them in front of larger, less targeted groups. Here we’ve reached the stalwarts of the past 100 years. Old-school advertising are still relevant. I would simply advise that you master your sales offer before creating your first commercial. Use the low-risk, low-cost options to perfect your pitch before moving upstream to the high cost, high-risk option. Since I was in over-drive writing mode for this article, I decided to add in another awesome free resource. In this one, I walk through how to setup your first funnel. 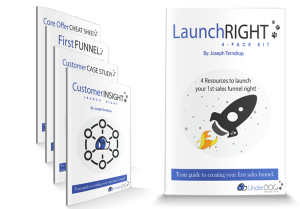 I put everything in very actionable steps, and I included my Core Offer Cheat Sheet that shares the tools I use to launch my customer’s sales funnels. Finally, I give you an outline of the best traffic source for most small businesses. Don’t forget to grab a copy of our First Funnel resource. Here’s the free download: Click Here. I contacted 35 influencers from around the web and asked them to share their tips with us in the sliders throughout this article. Hi! I’m Joseph, the founder of Underdog Marketing. I am passionate about digital marketing, growing businesses, and start-ups. I’m an insatiable learner and a repeat entrepreneur. I love writing and I work on projects that I find purpose in with people who I believe in. I look forward to connecting! #1: Is Your Website Hurting Your Business? #2: Is your business invisible online? #3: How can you stop one bad customer review from crippling you? #5: Has Technology left you behind?